Exterior drainage system: This is the most costly water control approach. This requires digging up the area around the foundation and rebuilding it similar to a new house installation. It also requires digging up shrubs and other obstacles around the house. 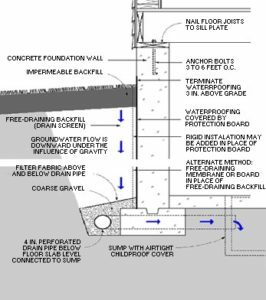 In most cases, an interior drainage system is a more economical and effective approach. Basement Drainage Systems: A drainage system is installed, under the floor, around the inside perimeter of the home and connects to the sump pump. The drainage system routes water to the sump pump and then the sump pump pumps the water out of the home. Sump Pump Installation / backup battery: The sump pump is made up of two parts, the sump pit and pump. Oriole uses all top of the line sump pumps and for most installations, we use a Zoeller sump pump. The pit (aka basin) is used to collect water and then the pump is used to pump out of the water outside out via exterior pipe. Backup battery is a recommend option that will provide added security when power goes out. IF power goes out, the backup battery will be used to power the sump pump. 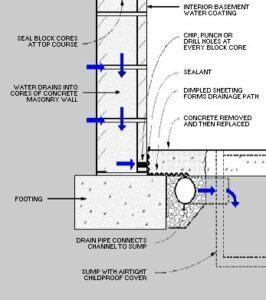 Window wells: Window wells are installed at the bottom of a window well and it allows water to drain down to the sub floor perimeter drain system. Egress windows: Coming soon Spring of 2018. An Egress window as an oversized window well that will increase the value of the home, dramatically brighten room and increase basement safety by providing a fire escape. Crack Repair: We use the grooving method to open the crack. Then, we install a mesh wire which leads down to the sump pump exterior system. After install, we patch the wall up. Expoxy Injection: Depending on the application, expoxy injection may be recommended to repair a crack. We fill the crack with expoxy and the expoxy prevents the water from entering. Dry Basement Inspection & Certificate: Oriole will inspect the basement and provide a certificate of inspection that meets VA or FHA requirements.